We love it when things we want are on sale. I mean, it’s great when things you need are on sale, but things you want? Now that’s exciting. Those cute sandals? Check. That bright blue nail polish? Check. That adorable running tank? Check check check! It’s like, you see something you want, but you say to yourself “Do you really have the money to spend on that right now? Do you really need that?” and then you flip over the price tag (curiosity killed the cat?) and overjoyed exclaim “This adorable pink ribbed skirt is only $5! !” 😀 Happy dance follows, and you go buy that skirt! Best feeling in the world. This scenario does not only happen at the shopping mall, oh no, but also at the grocery store! So many things you desperately want, but so many things you desperately need. Sacrifices must be made. Until you see the sign for 50% off blueberries. No compromising. No second-guessing. Some people see fruit for 50% off and think yuck, that’s disgusting! Not us. When we see fruit for that price, we get really excited. Giddy is probably a good term for it. When we see fruit for 50% off, we see opportunity. The Opportunity to make something full of fruit, without feeling guilty for wasting fresh fruit on something baked. Because to us, fresh fruit should be consumed as close to it’s natural state as possible, to enjoy them to their fullest extent. Yes, to us fruit that is half off is like finding 20 dollars in your pocket that you didn’t know you had. it may be a little mushy, it may leak out of the container and stain your shopping bag a bit, but it’s all worth it in the end. 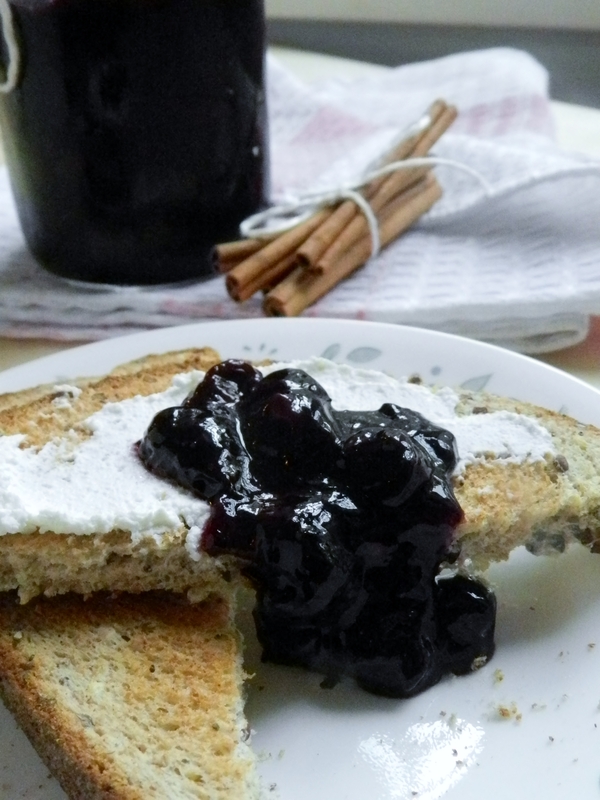 It’s all worth it when you’re slathering a piece of toast with homemade blueberry jam. 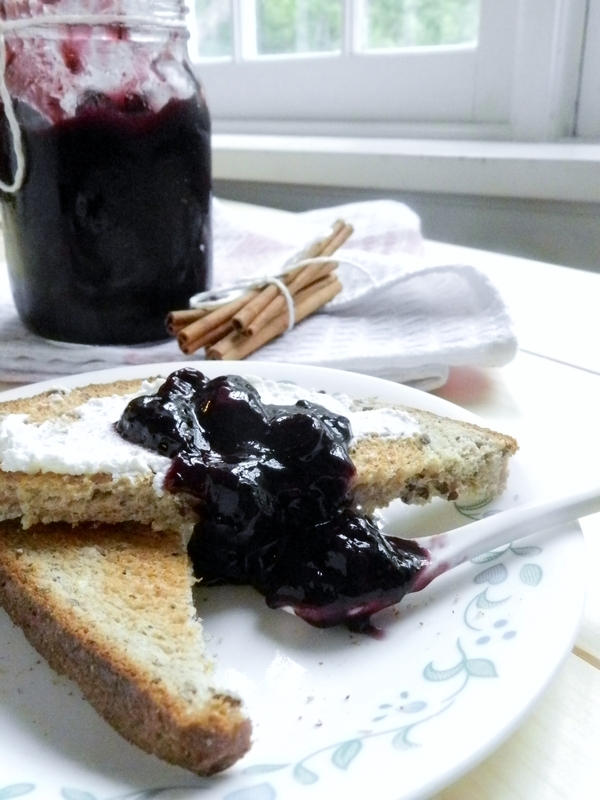 Blueberry Chai Jam, that is. What? 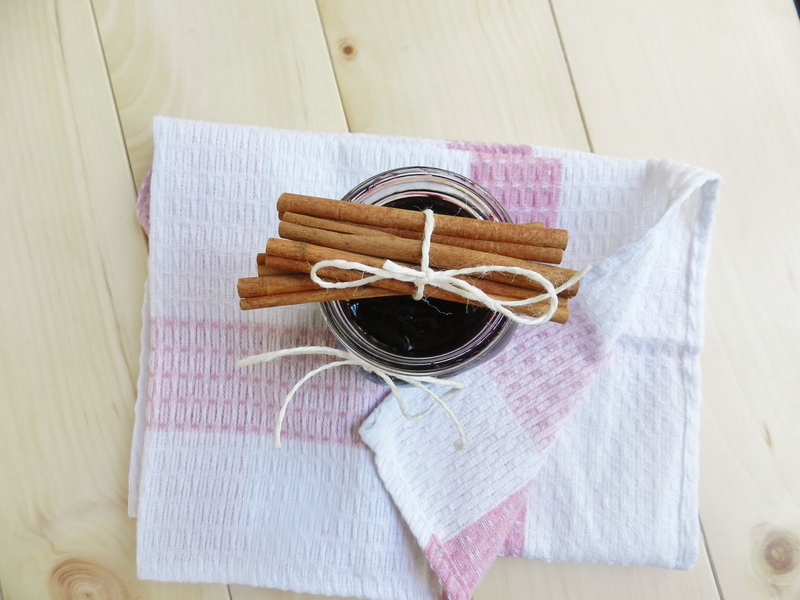 You didn’t actually expect us to make plain ol’ blueberry jam, did you? 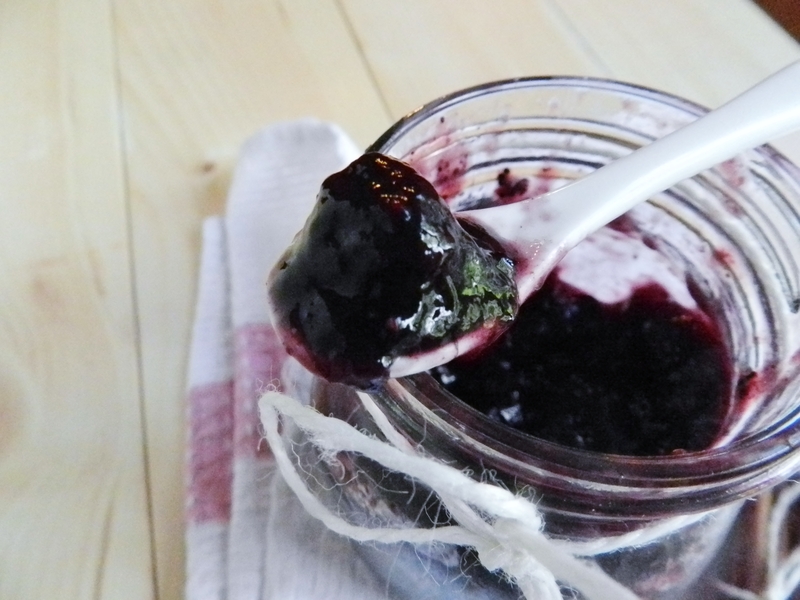 Not that there’s anything wrong with plain blueberry jam. It’s just, when you have the chance to experiment, why not go for it, right? This jam is surprising. When you look at it, you see blueberry. But then you taste it, and you’re blind-sided by an unexpectedly spicy kick. And by spicy we don’t mean hot, just… spicy. No other way to explain it. 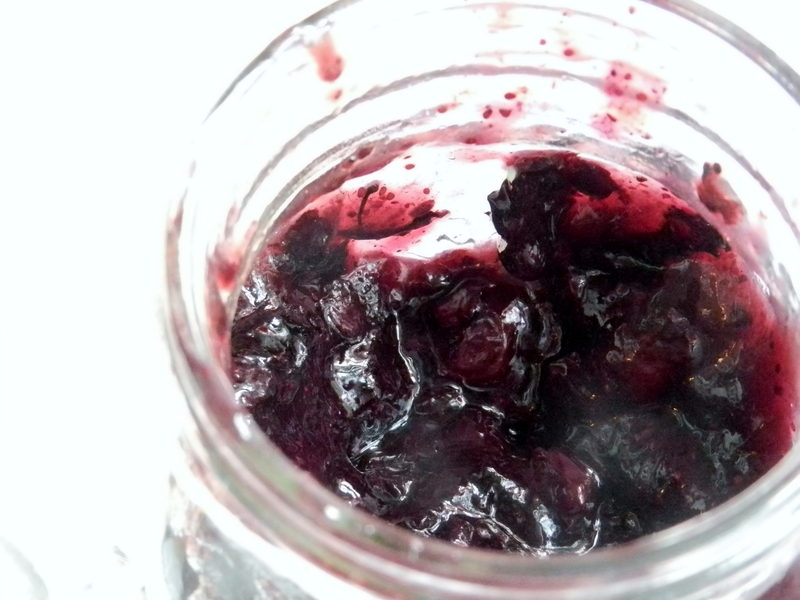 This jam still has lots of amazingly fresh blueberry flavour, and is FULL of big round blueberries. It has no refined sugar, and no preservatives. Just pure, blueberry goodness. It’s awesome for the summer, but we can totally see ourselves cosying up to it in the winter, too. Moral of the story? If you see a giant container of mushy, over-ripe blueberries for 50% off- BUY IT. Put blueberries in a pot and partially mash them. Add all the other ingredients and stir until everything (except cinnamon sticks) is dissolved. Bring to a boil, then turn to low and simmer for about 10 minutes, stir every minute or so. 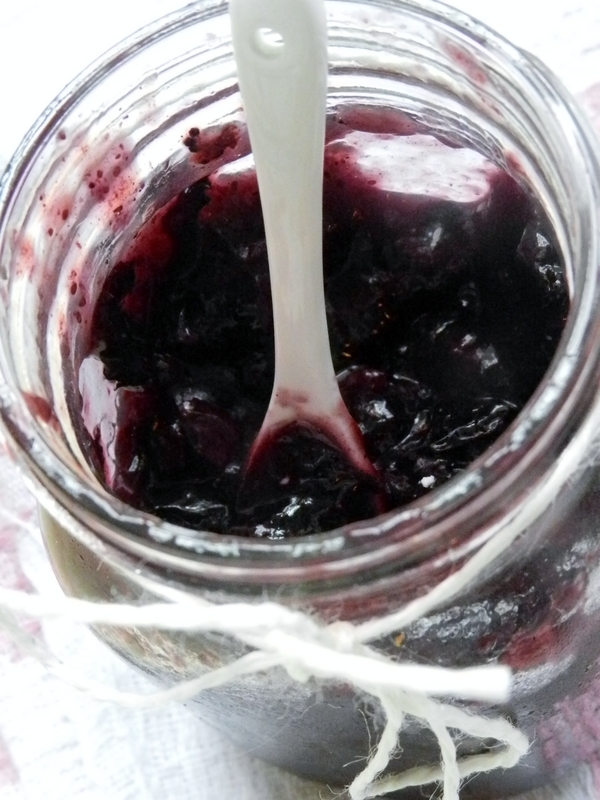 Remove from the heat, pour into a glass jar and allow to cool, then put in the refrigerator. Do you love getting fruit on sale? What do you do when your fruit is too ripe to eat? 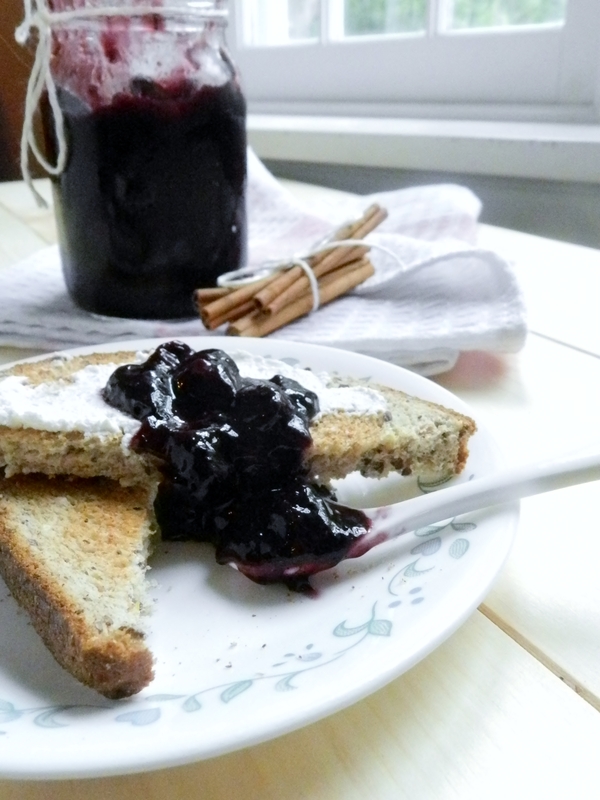 Posted in Uncategorized and tagged blueberry, chai, condiment, dairy free, easy, gluten free, healthy, jam, quick, spread, sugar-free, vegan. Bookmark the permalink. 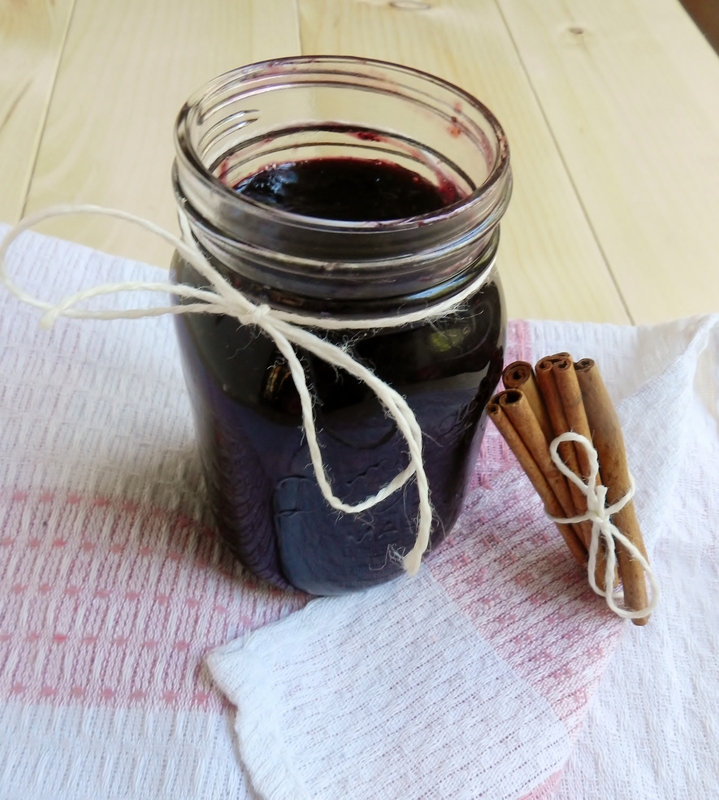 I am looking for a way to use my frozen blueberries because we are moving and I have way too much stuff in my freezer 🙂 Thank you for the recipe!